80 guys, 19 weeks, 21 meets, & 18 events … what’s the plan? Shane: One, for instance, likes to have a shoulder holster. Another one puts it in his in the belt of his pants. And there are some who like two guns. But one’s all you need if you can use it. Shane: What I’m telling you is as good as any and better than most. Translation – we all have our way, but my way has served me well. I took this picture last summer at the NCAA Finals. Brandon Stryganek shown here running the #2 leg. 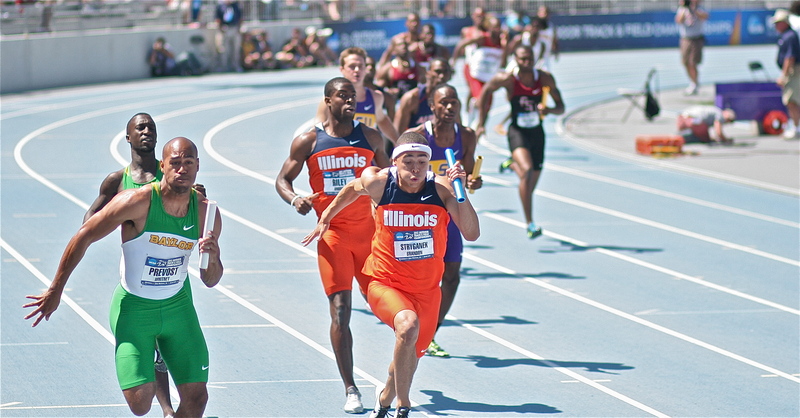 Andrew Riley, NCAA 100m & 110HH champ ran lead-off. Stryganek was Big 10 champ in 60m this year, 6.71. Click on picture to enlarge. I go into every week with a general plan which is flexible. I do not have a 3-ring binder of workouts for the 19-week season. On bad weather days, I never attempt a critical workout. My practice plan always takes the weather into account. Meets are workouts, hard workouts. It’s better to be under-trained than over-trained. Sprinters never practice the day after a meet. Nothing you do today makes you better tomorrow. However, you can diminish your tomorrow by over-training today. The idea that you can make sprinters FASTER during the season is, in my opinion, false. You CAN improve starts, hand-offs, sprint mechanics, and the love of racing. The goal of surviving the season and keeping your sprinters “happy & healthy” is more important than any workout or any meet. Cameron James, Edwardsville, was trained by Chad Lakatos & Alec Holler with methods very similar to mine. He ran 10.80 & 21.79. TRYOUTS: Jan 16 – Feb 9 (four weeks) … this is nothing more than a continuation of our winter speed & strength program started November 26. See previous blog for more information. Track “tryouts” coexist with the training done with all Plainfield North athletes. We do not meet as a track team. I could argue that I have 200 athletes trying out for my track team. We do not hurdle. We do not work on block starts. We do not work on relay exchanges. We never run more than 40 yards. 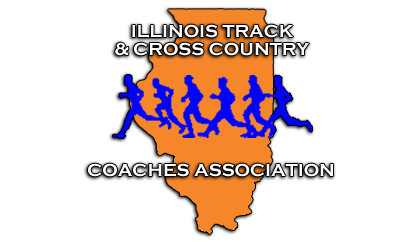 By the way, our distance group meets consistently through the winter with Coach Andy Derks. I consider Coach Derks the “governor” of his state. INDOOR: Feb 11 – Mar 23 (six weeks) … we do speed drills at every practice. After February 9th, we never do another 40-yard dash. One day a week we time 30-meter starts out of the blocks using the Summit Timing System, fully automated. We do no more than 3 starts in a practice. One day a week we do 10-meter flys, again automated. We do at least 3, some guys choose to do more. One day a week we do the 23-second drill (see below). This is our lactate-training for the week. One day a week, we do X-Factor (lunges, plyometrics, core, hip flexibility, short hurdles, and any other creative ideas we might want to try). If we have a 5th day, we run 4 x 180 negative splits. We run in a single line, no competition, focusing on form. We want each one to feel faster than the one before. Rest is usually 2-3 minutes, or whenever the guys feel like they are refreshed and ready to go. It is critical that no matter what speed, we always want it to look like sprinters (not joggers) and make it look easy. Meets are considered hard workouts, so we work out hard twice per week, the 23-second drill and the meet. We have five weekend meets (four on college tracks). We also have one fresh-soph meet. My hurdle coach and jumps coach can pull guys as needed. Sprinters do NOT practice on non-school days. I encourage my assistants to make appointments with their sub-groups on non-school days. SPRING BREAK: Mar 24 – Mar 31 … no practice, no meets. We do have our fundraiser, Fast Cat 5K, 10K, & 2x5K … see runfastcat.com. 19-week seasons need a break somewhere. I run a parent-friendly program. OUTDOOR: Apr 1 – May 25 (eight weeks). We typically have meets on Monday and Saturday until the last three weeks (last 3 weeks = championship season). Our sprinters work hard twice a week … 2 meets = 2 hard workouts. Sprinters do NOT have practice on the day after a meet, therefore Tuesdays would be considered a “sprint holiday”. Distance crew & throwers practice on Tuesdays. That leaves only Wednesday – Friday. Typically the three workouts would be X-Factor, 4×1 handoffs, and block starts. Those three days are also the only days that our hurdlers can hurdle and our jumpers can jump. Some guys are done in 25-30 minutes. Remember we do caffeinated speed drills every day. I know this “under-training” will bother all you distance coaches, but it serves us well. You would love to be a sprinter in my program … pretty spring day and you are done with practice at 3:00. When we get to the championship season, we do “Critical Zone Workouts” (see below). 23-SECOND DRILL: The invention of Chris Korfist. We only do this indoors during the indoor season. We have a 180-meter track, so we allow 24-seconds instead of 23. In this drill we run solo at top speed for 24 seconds. My assistants hold countdown timers and we measure how far each guy can run in 24 seconds. Chalk marks are put on the track. Pylons at each 10-meter mark. The goal is a personal best. However, we also tell our guys that if we get four guys at 200-meters in 24 seconds (23 seconds outdoor), we will medal at the state meet in both the 4×2 and 4×4. I encourage enthusiasm … our guys cheer each other on. We start the next guy before the first guy finishes. After eight minutes rest, each sprinter attempts to come within 5 meters of their first effort. At the eight minute mark, the sprinter is full of lactate and suffering from acidosis. The second sprint teaches the body how to deal with acidosis. Our hardest workout of the year lasts only 2 x 24 seconds. We do this four or five times per year and only indoors. In the short history of PNHS (only six graduating classes), we have run decent indoor 4×4’s … 3:29, 3:30, 3:30, & 3:32 … and decent indoor 4×2’s … 1:31, 1:31, 1:32, 1:33. 20 x 100: This is my go-to workout on those days where the weather is horrible but we need to get something done. We skip speed drills and everyone lines up on the goal line. We run as an entire team 100 yards in 14-15 seconds, the remainder of the minute is their rest. When the minute is up, we go back the other direction. 20 x 100 will last exactly 20 minutes. 20 minutes of practice and everyone goes home. Sometimes we only get to do this workout once … our field custodian will literally tell the Principal on me … the Principal calls the Athletic Director … and the Athletic Director will come out to the field to let me know we can’t be on the grass. By the time all of this happens, we are done with our workout. 5 HILLS: Find a hill with a gradual ascent and about 180 meters long. The hill can’t be too steep because you must be able to SPRINT the hill fast … not slow motion. Sprint 5 & take lots of rest in between. Time each one so that guys are held accountable. It’s all about speed. I have not found a suitable hill in Plainfield. CRITICAL ZONE WORKOUTS: We do one of these the week of Conference, one the week of Sectional, and one the week of State. You can make this anything you want but I basically do two broken 300’s with EIGHT MINUTES REST at goal 400 pace. My best guys have goals of 48-seconds. Example of a workout: 200 meters with run-in start at 24 seconds, 45 seconds rest, followed by 100 at 12 seconds. Rest 8 minutes. Run 150 at 18 seconds, 45 seconds rest, followed by 150 at 18. Done. My guys believe they can come very close to their goal if they are successful with this workout. I’ve done this as broken 400’s but I get the same results with 300’s. So you understand what we do with sprinters, but what about the distance crew, throwers, hurdlers, vaulters and jumpers? Jumpers train as sprinters and might jump once per week. My best-ever long jumper, Braden Jones 23-4, NEVER long jumped in practice. He trained as a sprinter and spent lots of time in the weight room. He spent 10 minutes the day prior to a meet working on his approach. 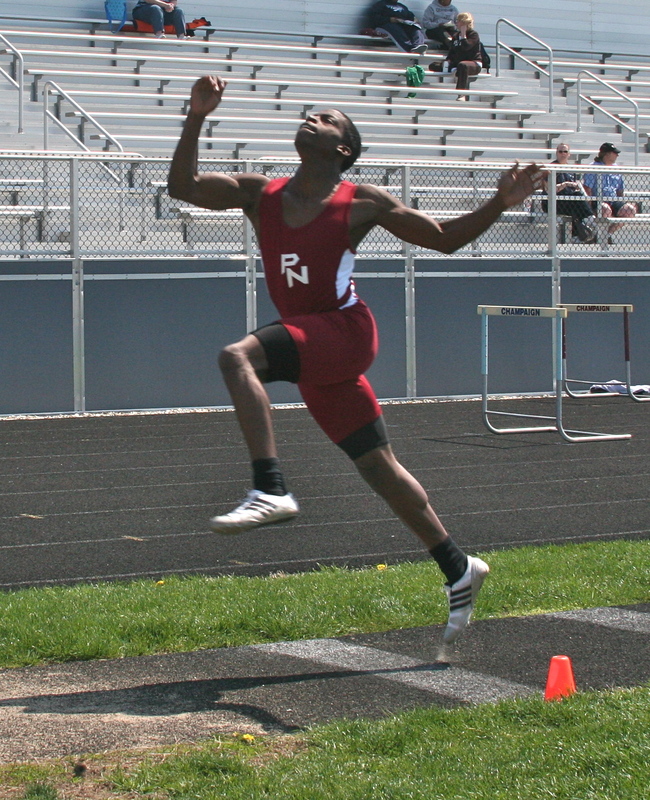 My best-ever high jumper, Damon Lampley 7-2, high jumped once per week in practice. Damon’s high jump workout often consisted of dunking a volleyball. 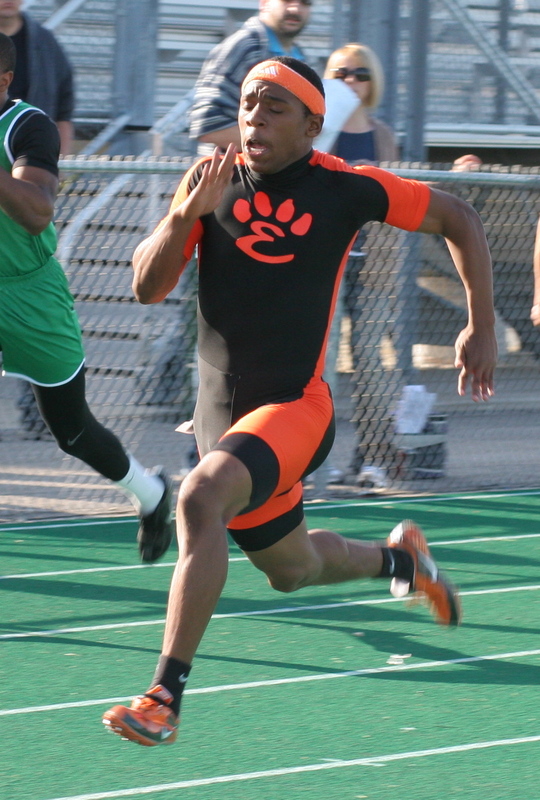 Jesse Brock ran the fastest FAT 100 in PN history, 10.97 and also long jumped 22-7. Fast guys jump well & great jumpers are very fast. Hurdlers are sprinters (if they are any good). I would like for our hurdlers to work on highs once per week and intermediates once per week. I encourage our hurdle coach, John Singleton, to keep everything short. DON”T TRY TO GET THESE GUYS IN SHAPE. I suggest no more than 2 or 3 flights of highs, no more than 1 or 2 flights of intermediates. Always run fast, always wear spikes. In addition, I believe in discounting hurdle distance and hurdle height. My vaulters vault as much as possible. However, vaulters are sprinters too. 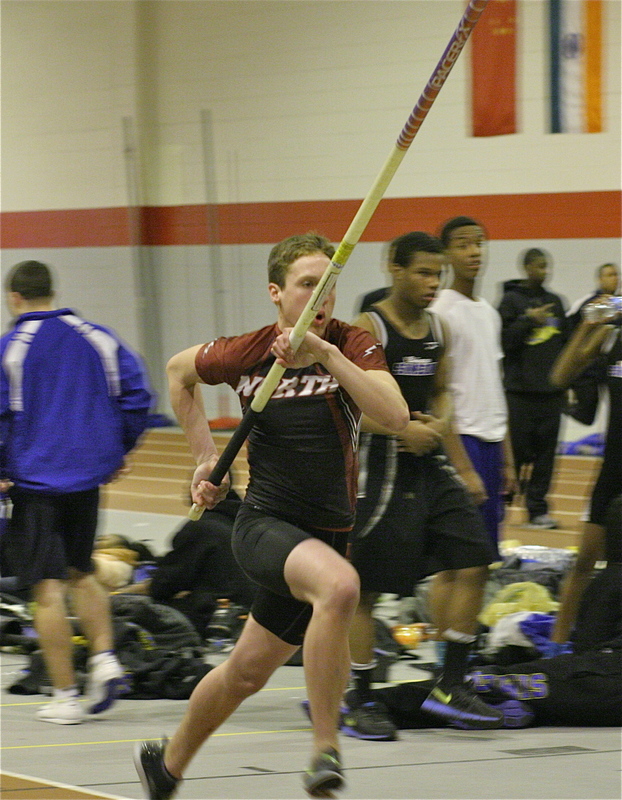 Vaulters are sprinters too. Will Heyl is shown here improving his vault PR from 11-6 to 13-0. Our throwers form their own group and report to their own coach, Sean Carlson. When I coached with NO ASSISTANTS at Franklin, TN, every single kid did sprint drills. I then told the throwers to “go throw” until I could come coach them. Like our throwers, our distance crew also reports to their own coach, Andy Derks. Throwers and Distance Crew are almost like their own team, we come together at meets. Without assistants, I had distance guys do speed drills, then go on a 30 minute run, then report back for some type of workout. They are much better trained under Coach Derks but I had good success with the three-prong approach of speed drills, road work, and intervals. 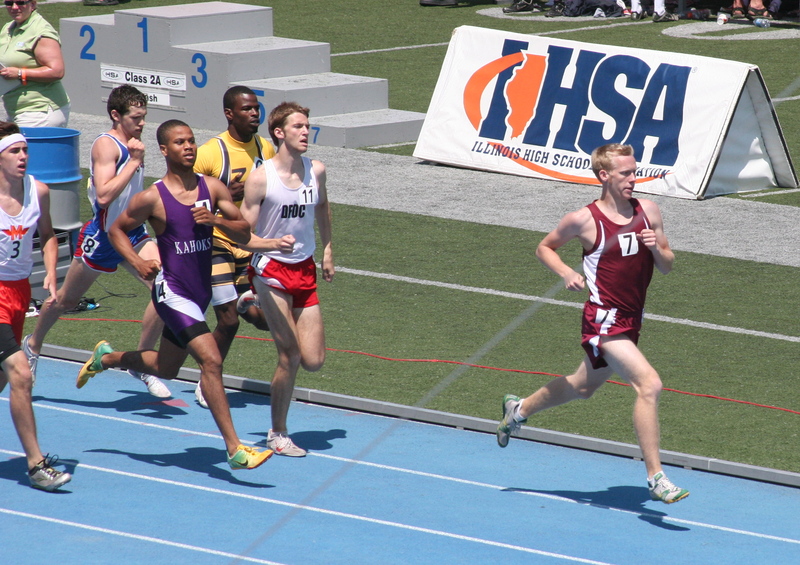 Austin Stone competing in the finals of the 2010 800-meter run. Is the 800 more of a “run” or more of a “dash”? My favorite 800 runners are fast guys. We all have our own ideas and philosophies. The total number of hard workouts for sprinters in 19 weeks of track & field …. around 10. Most hard workouts are 600 meters or less. We never run further than 200 meters. We always run fast. Volume is low. Intensity is high. Misery is low. Enthusiasm is high. Other teams may work harder, but we work smarter.